Salvation And Survival: Do You Still Doubt The Global Caliphate? Do You Still Doubt The Global Caliphate? You know, I look back over my thoughts of the last year-and-a-half that I've been writing this blog and the issues that I've felt were important to share, and it is amazing how far we've come in our national "transformation". Blog posts on food storage, firearms training, and threats to our Constitution seem "old hat" now. If you haven't sought information on these topics yet, then you are waaay behind the curve. Because, in case you haven't noticed, the intent to change our American way of life has come out of the shadows and it is much more "in your face". Whether it is the hijacking of our education system through the Common Core Standards, the intimidation by the IRS of anyone who doesn't agree with the Party in power, or the metamorphosis of our law enforcement system into using military-style tactics --- it's all designed to change the very foundation of this country. And this realization leads me to a news item that I found not only disturbing, but quite alarming. 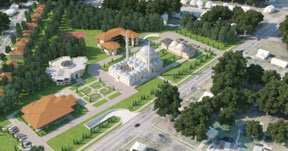 Last week, The Clarion Project reported on the building of a 15-acre, $100 million mega-mosque in Maryland. Nothing illegal there; we have freedom of religion in this country. But The Clarion Project, which is a non-profit organization that draws together Middle East experts, scholars, human rights activists and Muslims to promote tolerance and moderation and to challenge extremism, says there is much more to this "Largest and most striking example of Islamic architecture in the western hemisphere." Indeed, Turkish Prime Minister Erdogan, who visited the site, warned an audience in attendance that there are groups in America promoting “Islamophobia.” He branded such potential critics as paranoid bigots. And to further his "official" statement about the virtues of Islam, he attempted to stage a meeting between the President and the father of one of the Islamists killed while on a Turkish flotilla which was trying to break Israel’s weapons blockade on Gaza. Alas, he had to settle for John Kerry. But behind the scenes there was a more disturbing narrative. Also in attendance at the media blitz for the mega-Mosque were the leaders of two U.S. Muslim Brotherhood entities. One of the men is Naeem Baig, the president of the Islamic Circle of North America (ICNA). A 1991 U.S. Muslim Brotherhood memo lists ICNA as one of “our organizations and the organizations of our friends.” The memo says its “work in America is "a kind of grand jihad in eliminating and destroying the Western civilization from within.” Comforting, isn't it? I'm sure you are aware that outspoken critics of the Muslim Brotherhood, like Glenn Beck and former UN Ambassador John Bolton, have warned about the desire for the establishment of a global Caliphate, which is an Islamic state led by a supreme religious as well as political leader. They've been laughed at and mocked by the MSM. I don't know about you, but the statement above by the ICNA seems to go a long way towards substantiating their claims. If you still need convincing, consider this: the Turkish government has been quietly spreading its influence in the U.S., but Erdogan's public invovlement in the building of this center takes Turkey's "outreach" in America out of the realm of the subtle. The Clarion Project also recently reported on the growing ties between the Turkish government and Native American tribes. With Congress' help, thousands of Turkish contractors and their families may be flooding into America's heartland and settling in semi-autonomous zones of the Native Americans, well out of the reach of American authorities. Why would that be, do you think? And if you think all this is subtle maneuvering by the Islamists, there is an even more frightening aspect to their influence. Right here in Texas, there is an investigation into the Cosmos Foundation, a charter school operator founded a decade ago by a group of professors and businessmen from Turkey. The group, currently using the name Harmony Schools, has become the biggest charter operation in the state. True, its primary mission is educating schoolchildren, and it has carefully garnered a reputation for elevating our failing educational rates in the areas of math, science, and computer technology -- which makes it quite attractive to parents who want their children to be in the top percentile. But what better way to infiltrate this foreign agenda than through our schools and our children's education? But the Cosmos Foundation has also forged ongoing relationships with a close-knit network of businesses and organizations run by Turkish immigrants. Some of those founders, as well as school operators, and many of their business suppliers, are followers of Fethullah Gülen. This is important to Americans because Turkey’s regression from a secular democracy into an Islamic state may be based on this educational movement that has also taken root in America. Imam Fethullah Gülen and his Gülen Movement (GM) have had enormous influence in setting the increasingly Islamist agenda in Turkey. In fact, in Turkey, 75 % of the nation’s two million preparatory school students are enrolled in Gülen institutions. 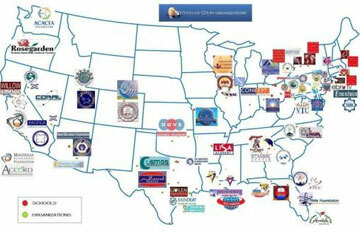 In America, GM runs the largest charter school network in the nation. When you connect the dots, don't you think all this information is worthy of our scrutiny and our concern? Isaiah 1:7 "Your country lies desolate; your cities have been incinerated. Before your very eyes, foreigners are devouring your land— they've brought devastation on it, while the land is overthrown by foreigners." It would be one thing to have Islamic centers coming to spread their faith in America if Christians were free to practice and testify in Muslim nations. Sadly, Christians can't. They are being persecuted, forced to convert to Islam, and killed in Lebanon, Syria, Saudi Arabia, Pakistan, Iraq, Nigeria, Iran, Afghanistan, Indonesia, Egypt and Turkey...and those are just the countries I can think of off the top of my head! I will always support Freedom of Religion. But I will never forget that the core drive of Islam is to Convert, Submit or Die. Muhammad himself said that any truce or agreement with non-Muslims should be honored only so long as it took for Muslims to assemble the means and numbers to overcome the other side. Any other option would be counter to the word of their Prophet and to do otherwise would be apostasy. They give no other choice. If any wonder what would be the fate of any people who don't submit, look at the history and destruction of the Jewish tribe of the Banu Qurayzah. Muhammad beheaded so many himself that the number can only be estimated in the multi-hundreds. Please people, listen to this man! He knows what he is talking about! Just take a look at today's headlines and see what Erdagon is doing to his own people who disagree with him! They may be subtle in their methods this moment, but believe me they have a very determined agenda for destroying this country and the West! Obama is planning summits across American (at taxpayers expense) to find out what Muslin immigrants want from American. I guess the welfare, food stamps, healthcare, and housing isn't enough. I think we all know what they want, to destroy America and Obama is more than happy to oblige. Do the liberals really think they will be exempt from Muslin tyranny? Christians in this country need to wake up, turn off the TV and get some bible doctrine in their souls before it's too late. We do not have to be tolerant to an evil that will destroy us. You are absolutely right! Our political and social policies of tolerance will be our means of destruction. And soon, we will all see the mask come off of this "peaceful" religion! My wife and I live in an area that is 20 miles from GM's site in PA. It is a known fact that during the Bush years he was being watched .... and they should have been, for it is a compound that one DOES NOT step foot upon. Armed security are at the entrance gate and there is no contact unless it is on their terms - now fast forward a few years and during Barack's tenure, it is pretty well known that it is " hands off " , no scrutiny is allowed. Many more actual anecdotes I could present ( and verify if sources were bold enough ) to shed light on their " unusual culture " as it relates to the community..... but I suppose the guv'mint has things well under control ! What is really scary to me is that so many parents are caught up in getting their kids to the top of the class, that they are totally unaware of the affiliations of these charter schools. Someone at a church in Austin, TX brought the Turkish connection to the attention of our Sunday School class, and the parents in the room had no idea! I shudder to think of the indoctrination their children are subjected to! I think we are seeing a slow and subtle dismantling of this country from within. And people are so asleep!